– for intense sequences of action/adventure violence and some frightening images. With 2007 being a summer of threequels, it’s all too easy to have unreachable expectations for new installments in some of the most successful film franchises ever made. The latest to hit theaters this summer is Pirates of the Caribbean: At World’s End, the final part of a trilogy-long story. With the success of 2003’s The Curse Of The Black Pearl, two sequels were penned as one long follow-up story to be released in two parts within a year of each other. Last year’s Dead Man’s Chest, the first of the Pirates sequels, was a huge success and a well-fashioned continuation of the story. At World’s End is the final chapter, and director Gore Verbinski and company do their best to take it out on a grand scale. The Curse Of The Black Pearl established characters and a story unlike anything moviegoers had ever seen. Johnny Depp embodied what is arguably the best pirate character of all time, Captain Jack Sparrow, even well deserving the Oscar nomination he garnered for it (and sadly did not win). 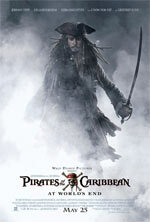 The film was imaginative and brilliant, weaving a story with fantasy elements into a tangible pirate world. A curse served as means to create fantastical characters of “undead” skeleton pirates. The sequel took a much more extraordinary look into this world, telling a far less tangible and much more outrageous story that allowed the further exploration of pirate lore to include the addition of Davy Jones, the legend of his curse, his crew’s curse as sea mutant creatures, and even the introduction of a sort of voodoo witch. At World’s End takes the fantasy even further, and in the process goes far over the top in many cases. From ridiculous sight gags like hallucinations Jack experiences to bringing more and more legend and myth into the story, things just get even more far-fetched and complex as it progresses. As a story of fantasia – in the same vein as perhaps the Lord Of The Rings books – the Pirates realm works, but in keeping with the more realistic portrayal of pirate lore with a “ghost story” twist, At World’s End just goes overboard. First off, At World’s End is easily the darkest and most violent of the three films. It’s the Pirates version of Star Wars‘ Revenge Of The Sith meets Lord Of The Rings‘ Return Of The King. It’s the close of a trilogy with all the epic battle violence you can expect. Sadly, those strange, gross and twisted moments that sprinkle the first two films are included in full here as well. From a man breaking off his frozen toe (played for sort of “sick humor”) to brief glimpses of a head with a knife-like object sticking through the top of it or a person killed by tentacles running into their mouth and out their nose, it’s rather the typical squirm-inducing violence that Verbinski seems to enjoy injecting into these films. However, the violence goes far beyond those moments this time around. 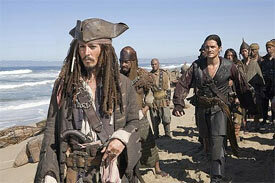 The film’s opening scene shows dozens of men, women, and even a child being hung for their association with even the slightest bit of piracy. Although nothing particularly graphic is shown, it’s a disturbing and morbid way to launch the final installment. We already despise Lord Cutler Beckett from the first sequel, so it seems unnecessary to remind us just why we hate him at the start of At World’s End. And while most fight sequences in the first two films involved man versus creature and vice versa, a lot of the action here is man versus man, with all kinds of slicing, impalings via sword, and explosions via cannon fire that make this feel more like an epic, creatively embellished version of The Patriot than Pirates Of The Caribbean. “Brutal” may be the best word to describe it, and in the end, the action pushes the PG-13 boundary about as far as it possibly can go. There’s nothing about At World’s End that is suitable for young audiences and families with children. Although The Curse Of The Black Pearl is the best story of all of them, and features the best acting, At World’s End is an improvement upon the first sequel in regards to the former. Depp is as good as Sparrow here as ever, while many other characters are either shortchanged on screen time or are given less to do due to plot restraints. Sadly, we don’t get to see Bill Nighy shine as Davy Jones quite as brightly as he did in Dead Man’s Chest, but he is given a few standout moments before film’s end. It’s great to see Geoffrey Rush return as Captain Barbossa, and the heroics and maturity of Orlando Bloom’s Will Turner and Keira Knightley’s Elizabeth Swann come to a peak here as well. It’s interesting to observe their transformations over the course of the series. The plot of At World’s End is mind-numbingly complex. It’s often confusing and hard to follow every storyline that’s being thrown in your direction – from established ones to brand new ones. It feels too much like the writers paced out the second film more and then realized they had to cram so much into an almost three-hour third film. And Verbinski takes his sweet time building up the film to its grandiose climax. The final battle is impressive to say the least and indeed will have fans on the edge of their seats, but getting there is the taxing part. And this time around, we get a look inside of Jack Sparrow’s mind as he hallucinates and struggles with his inner voices – which Verbinski mistakenly shows us visually in a few completely out-of-place cheesy sequences. 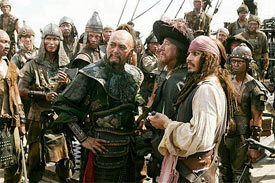 It’s partly amusing due solely to Depp’s performance(s), but it just doesn’t feel right for a Pirates film. To see several dozen Jack Sparrows interacting and then to later him have two small Jack Sparrows sitting on his shoulders whispering ideas into his head pulls the audience out of the Pirates Of The Caribbean world a bit too much, making it seem more corny and cartoony than it should (and there’s this pointless focus on rocks that turn to crabs that is more of a waste of film than anything). Although, without divulging details, they may have taken Elizabeth’s character development a bit too far, possibly making her out to be more than she should be made out to be, but it ultimately plays out well with how the story progresses. The famed cameo by Rolling Stone guitarist Keith Richards as Jack’s father is humorous but altogether unneeded. But considering how loopy the films have increasingly become, it’s not all too unbelievable by the time he shows up. At the same time, however, when we soon watch a character grow to be the size of a giant for a brief moment, nothing we’ve seen up until that point (or after, for that matter) allows for the absurdity to reach such heights or fit with the whole of the series. Bigger isn’t exactly better, and that concept apparently was not considered when planning on how to close the book on this particular adventure. In the end, it all adds up to an outrageous fairy tale or bedtime story – not the kind of action/adventure experience established with the first film. Despite its flaws (and there are plenty), At World’s End is a decent finale. It has its moments and its resolutions, and is ultimately satisfying, but while watching it, it’s all too tempting to expect more. Over half the film tends to drag on, and the convoluted nature of the story makes repeat viewings necessary. While I enjoy having to exercise thought with my film watching, it’s really not needed for our action/adventure genre flicks to require note taking or cheat sheets to follow along to. If you’re a fan of the series, watching the first two right before seeing this one is a must. Regardless, the ship battles are impressive and some of the fight sequences are breathtaking (and finally seeing Davy and Jack duke it out is a joy!). Sadly, At World’s End is also often extremely violent for a PG-13 Disney-stamped adventure film. Violence: Extreme. Many hangings, plus lots of stabbing – including many impalings and stab-throughs, slicing, explosions, etc.